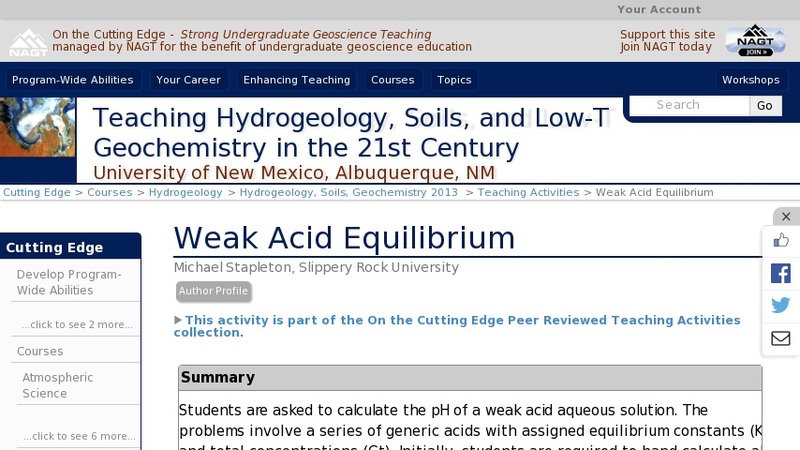 Students are asked to calculate the pH of a weak acid aqueous solution. The problems involve a series of generic acids with assigned equilibrium constants (Ka) and total concentrations (Ct). Initially, students are required to hand calculate all problems by algebraic manipulation of the mathematical relationships of the system. The solution is a cubic equation. Through a series of assumptions, the solution is simplified. The assumptions are based on the chemistry of the system given the Ka and Ct for the problem. The problems are then graphically solved. Ultimately, the students develop an Excel worksheet to solve the problems and a Bjerrum plot to display the speciation as a function of pH.